I am not a lawyer or an accountant. Any legal or financial advice I give is my opinion based on my own experience. Always seek the advice of a professional before acting on something that I might say. 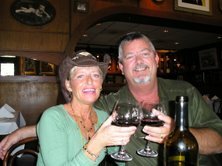 I live in Haines City Fl with my wife of 25 years, Billie aka TLW “The Lovely Wife”. We have identical twin boys who are 34 and 6 grandchildren. I love to fish, read and soak up knowledge. I am actively involved in the Dundee United Methodist Church and give to my favorite charity World Vision.